Posted on July 27, 2017 April 24, 2019 , in Hot Tubs. You’ve been thinking for a long time about buying a hot tub or spa. You’ve started doing the research to find out which option is the best fit for you. Your next step is to know which questions you need to ask to make the best possible purchase. Below you’ll learn about the top questions you should know the answers to before making a purchase. Question #1: What do I Want? When asking yourself: which hot tub should I buy, make sure you’re clear on what you want in a hot tub. Is it primarily for relaxation? Therapy? To connect with loved ones? Also think about what others will use the hot tub for. Then make a list of what you most need in a hot tub. This will help steer you toward hot tubs that are right for you and keep you from being swayed by models with every feature under the sun, which can be costly and use a lot more energy. Question #2: What is my Budget? Knowing your budget is an important starting point, but make sure you understand how much a good hot tub costs beforehand. You should expect to spend at least $7000 on a quality hot tub. In addition to this, you’ll need to pay for at least some of the following: the concrete base, electrical hookups, installation, cover, and monthly heating. If your budget can’t accommodate a quality hot tub, it’s better to wait than to buy a cheaper one now. Question #3: What is it Made of? Before you invest in a hot tub, choose one that is made of quality materials and components. Hot tubs that are made of fiberglass-backed acrylic are much stronger than those made of plastic. In addition, the pump should deliver one horsepower per five to eight jets. Quality insulation that can direct heat back into the hot tub, a locking hard cover, and outstanding massage features are also important features. Question #4: How Good is the Warranty? Getting a full warranty rather than a pro-rated one is crucial as it will prevent you from having to pay for any of the repair costs in case of an issue. A good warranty will cover parts, labor, and travel to your home. In addition, it should start on the day you purchase the hot tub. Also find out where servicing will happen. The best option is a retailer with experienced staff that can do this work in house. Question #5: What is Maintenance Like? All hot tubs require some level of maintenance, but lower quality ones will require you to do more than better quality ones. Make sure to ask the dealer which maintenance tasks you’ll be responsible for. If you aren’t comfortable with them, find out about service packages where they visit your home to do routine maintenance for you. 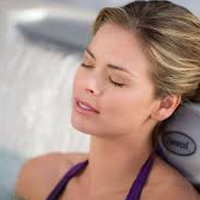 You can also look into self-cleaning hot tubs which will skim, vacuum, and filter for you. Now that you know the top five questions you need to ask before purchasing a hot tub, download our buyer’s guide to start looking for the answers.